Lack a sense of what values of GCF or LCM might be reasonable for a given pair of numbers. Before the lesson, students work individually on an assessment task, Thinking of Two Numbers, which is designed to reveal their current understanding and difficulties. You then review their solutions and create questions for students to consider in order to improve their work. In a whole-class introduction to the lesson, students review their understanding of GCF and LCM. They then examine some sample student work and evaluate the different approaches taken. 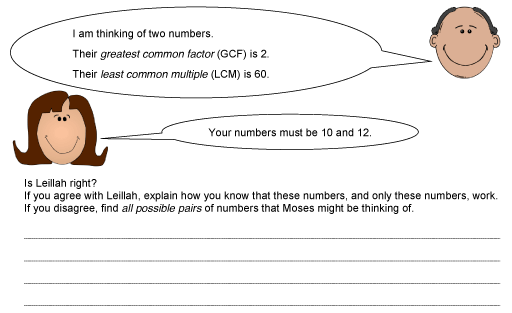 Students then take part in a collaborative task, in pairs or groups of three, in which they complete a grid, finding numbers to satisfy different constraints of GCF and LCM. As they do this, they learn more about how these quantities are related to each other and to the numbers. Then in a whole-class discussion, students consider their approaches and share their conclusions. In a follow-up lesson, students receive your comments on the assessment task and use these to attempt a similar task, Thinking of Two Numbers (revisited), approaching it with insights that they have gained from the lesson. Each student will need a copy of the assessment task Thinking of Two Numbers and Thinking of Two Numbers (revisited), a mini-whiteboard, pen, and eraser. 20 minutes before the lesson, a one-hour lesson and 15 minutes in a follow-up lesson. Timings given are approximate and will depend on the needs of your class. 6.NS: Compute fluently with multi-digit numbers and find common factors and multiples.